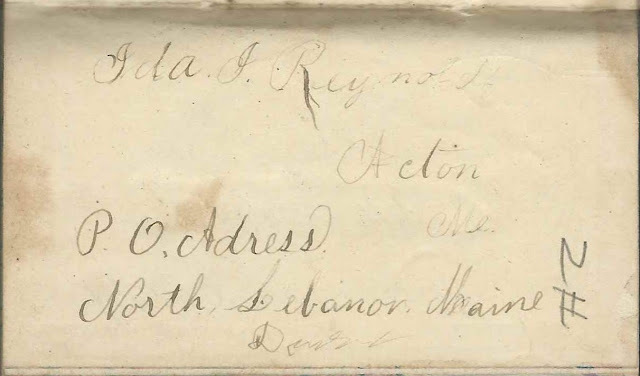 September entries in the 1873 diary of Ida Isadore Reynolds (1860-1946) of Acton, Maine. Ida would marry John Jotham Shapleigh (1856-1923) in 1881. Links to the months of August 1873 and October 1873 appear here and at the end of this post. 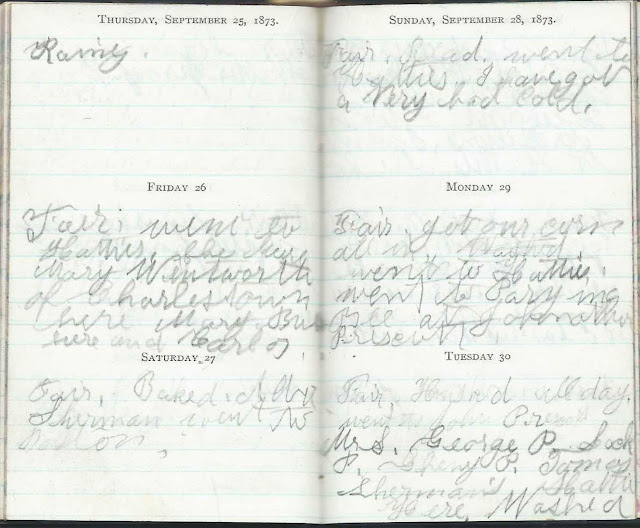 Monday, September 1, 1873: Rainy. Made 7 [?] Vests. Washed. Everett went to Mr. Hilton's. Went to Tom's. Mr. Hilton here. Tuesday, September 2, 1873: Fair. Ironed. Grand Mother and Uncle Jacob up in ___ down to go to ____ [Quarterly ?] Meeting. Wednesday, September 3, 1873: Fair. went to Meeting to the Corner. Rosette Jones and Mar Jones. ___ Aunt Martha. Went to Uncle John's. Thursday, September 4, 1873: Rainy. Came home. was ___[very or tummy] Sick. Mr. Hilton here. Friday, September 5, 1873: Fair. Made 6 Vests. Saturday, September 6, 1873: Fair. Baked. Made 9 Vests. Got them all done. Sunday, September 7, 1873: Fair. Read. Jessie here. Lute, Charlie Prescott. 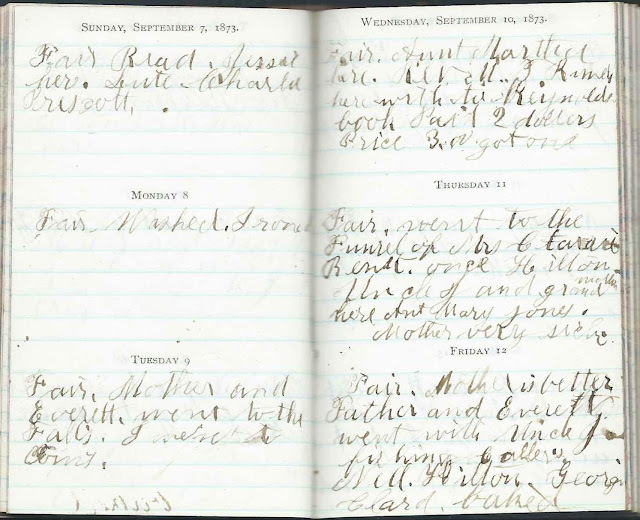 Monday, September 8, 1873: Fair. Washed. Ironed. Wednesday, September 10, 1873: F air. Aunt Martha here. Rev. M. T. R. here with two Reynolds book Paid 2 dollars. Price 3.00. got one. 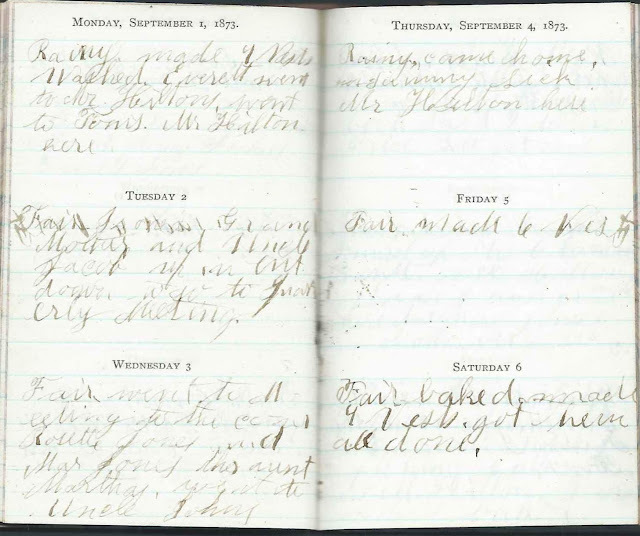 Thursday, September 11, 1873: Fair. Went to the Funeral of Mrs. Carrie [Ida originally wrote Clarissa but crossed out some of the letters.] Bennett. Once Hilton. Uncle J and Grandmother here. Aunt Mary Jones. Mother very sick. Friday, September 12, 1873: Fair. Mother is better. Father and Everett went with Uncle J fishing. Callers, Nell Hilton, Georgia, Clara. Baked. 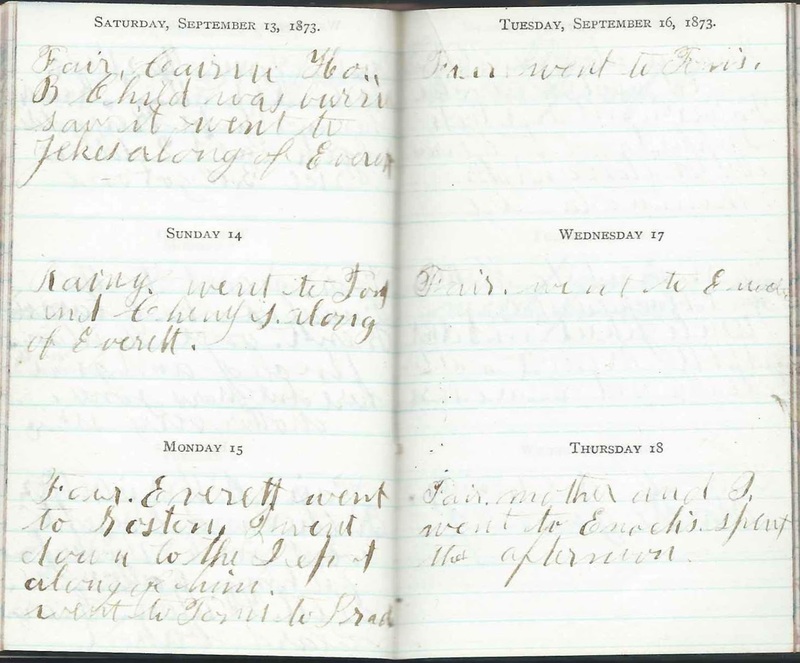 Saturday, September 13, 1873: Fair. Carrie H or B Child was buried. Saw it. Went to Zeke's, along of Everett. Wednesday, September 17, 1873: Fair. Went to Enoch's. 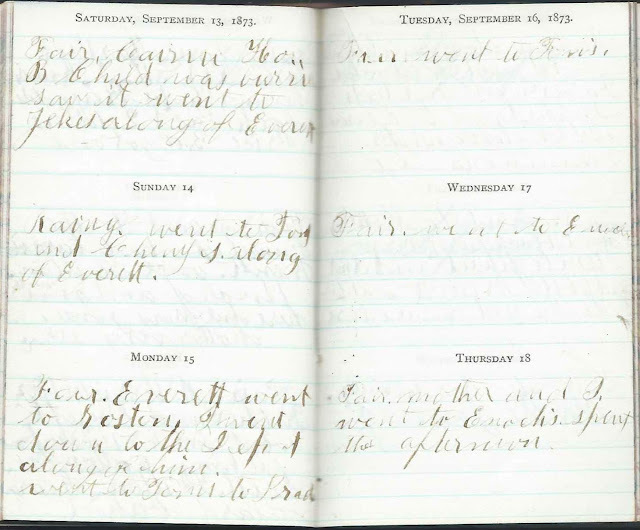 Thursday, September 18, 1873: Fair. Mother and I went to Enoch's. Spent the afternoon. 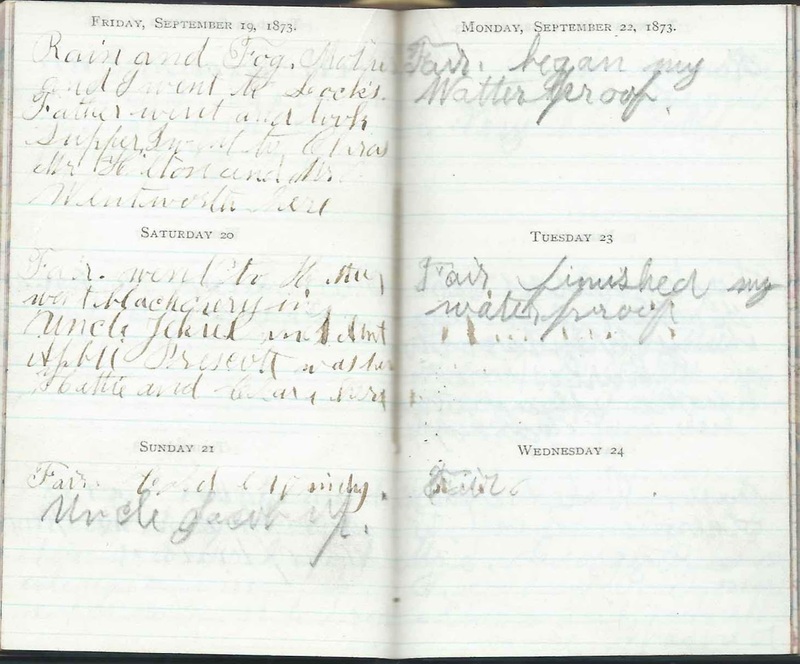 Friday, September 19, 1873: Rain and Fog. Mother and I went to Lock's. Father went and took supper. I went to Clara's. Mr. Hilton and Mr. Wentworth here. Saturday, September 20, 1873: Fair. Went to Hattie's, went blackberrying. Uncle John and Aunt Abbie Prescott. Sunday, September 21, 1873: Fair. Cold & Windy. Uncle Jacob up. 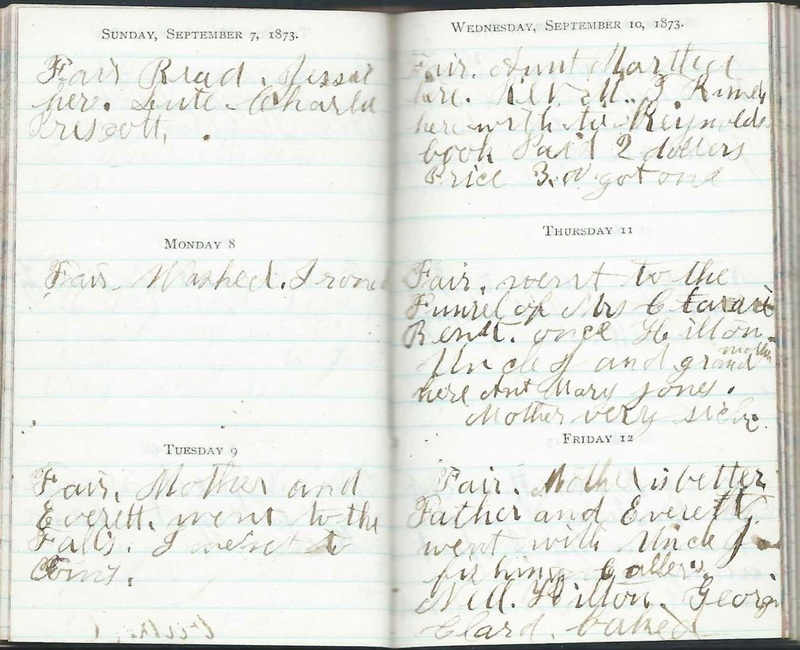 Thursday, September 25, 1873: Rainy. 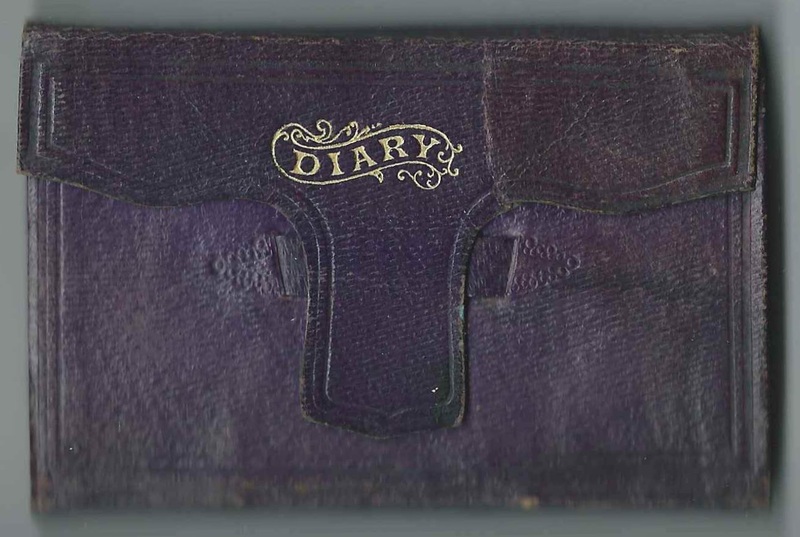 Friday, September 26, 1873: Fair. Went to Hattie's. She here. Mary Wentworth of Charlestown here. Mary ___ and Carlos. Saturday, September 27, 1873: Fair. Baked. Abbie [or Alva or Albert?] Sherman went to Boston. Sunday, September 28, 1873: Fair. Read. Went to Hattie's. I have got a very bad cold. Monday, September 29, 1873: Fair. Got our corn all in. Went to Hattie's. Went to Prayer Meeting at Jonathan Prescott. Tuesday, September 30, 1873: Fair. Husked all day. Went to John Prescott's. Mr. S, George P., Lock P., Cheny P., Tomas Sherman's, Hattie here. Washed. Tom - presumably Thomas Sherman (1823-1893) and Abigail Elizabeth (Fox) Sherman (1822-1877), "Abbie", and father of Ida's friend Harriet Eldora Sherman (1859-1937), "Hattie"
Rosette Jones and Mar Jones - presumably Rosetta (Prescott) Jones (1816-1889) and ? Mary Wentworth of Charlestown - Charlestown, Massachusetts or Charlestown, New Hampshire? Advance to October 1873 or return to August 1873.